This article is about the field of study. For television channel of the same name, see Military History (TV channel). For the book by John Keegan, see A History of Warfare. For the television series, see The History of Warfare. For the Wikipedia Project, see Wikipedia:WikiProject Military history. Military history is a humanities discipline within the scope of general historical recording of armed conflict in the history of humanity, and its impact on the societies, cultures and economies thereof, as well as the resulting changes to local and international relationships. Professional historians normally focus on military affairs that had a major impact on the societies involved as well as the aftermath of conflicts, while amateur historians and hobbyists often take a larger interest in the details of battles, equipment and uniforms in use. The essential subjects of military history study are the causes of war, the social and cultural foundations, military doctrine on each side, the logistics, leadership, technology, strategy, and tactics used, and how these changed over time. On the other hand, Just War Theory explores the moral dimensions of warfare, and to better limit the destructive reality caused by war, seeks to establish a doctrine of military ethics. As an applied field, military history has been studied at academies and service schools because the military command seeks to not repeat past mistakes, and improve upon its current performance by instilling an ability in commanders to perceive historical parallels during a battle, so as to capitalize on the lessons learned from the past. When certifying military history instructors the Combat Studies Institute deemphasizes rote detail memorization and focuses on themes and context in relation to current and future conflict, using the motto "Past is Prologue." The discipline of military history is dynamic, changing with development as much of the subject area as the societies and organisations that make use of it. The dynamic nature of the discipline of military history is largely related to the rapidity of change the military forces, and the art and science of managing them, as well as the frenetic pace of technological development that had taken place during the period known as the Industrial Revolution, and more recently in the nuclear and information ages. An important recent concept is the Revolution in Military Affairs (RMA) which attempts to explain how warfare has been shaped by emerging technologies, such as gunpowder. It highlights the short outbursts of rapid change followed by periods of relative stability. This branch of our discipline flourishes in an intellectual ghetto. The 144 books in question [published in 1968-78] fall into two distinct classes: works aimed at a popular readership, written by journalists and men of letters outside academic circles, and professional work nearly always produced within the military establishment.... The study of military history in universities remains seriously underdeveloped. Indeed, lack of interest in and disdain for military history probably constitute one of the strangest prejudices of the profession. Historiography is the study of the history and method of the discipline of history or the study of a specialised topic. In this case, military history with an eye to gaining an accurate assessment of conflicts using all available sources. For this reason military history is periodised, creating overlaying boundaries of study and analysis in which descriptions of battles by leaders may be unreliable due to the inclination to minimize mention of failure and exaggerate success. Military historians use Historiographical analysis in an effort to allow an unbiased, contemporary view of records. One military historian, Jeremy Black, outlined problems 21st-century military historians face as an inheritance of their predecessors: Eurocentricity, a technological bias, a focus on leading military powers and dominant military systems, the separation of land from sea and recently air conflicts, the focus on state-to-state conflict, a lack of focus on political "tasking" in how forces are used. If these challenges were not sufficient for the military historians, the limits of method are complicated by the lack of records, either destroyed or never recorded for its value as a military secret that may prevent some salient facts from being reported at all; scholars still do not know the exact nature of Greek fire for instance. Researching Operation Enduring Freedom and Operation Iraqi Freedom, for example, have presented unique challenges to historians due to records that were destroyed to protect classified military information, among other reasons. Historians utilize their knowledge of government regulation and military organization, and employing a targeted and systematic research strategy to piece together war histories. Despite these limits, wars are some of the most studied and detailed periods of human history. Military historians have often compared organization, tactical and strategic ideas, leadership, and national support of the militaries of different nations. Of historians in the field of diplomatic history, 7% are Socialist, 19% are Other, 53% are Liberal, 11% are None and 10% Conservative. Of military historians, 0% are Socialist, 8% are Other, 35% are Liberal, 18% are None and 40% are Conservative. People interested in military history from all periods of time, and all subtopics, are increasingly turning to the Internet for many more resources than are typically available in nearby libraries. Since 1993, one of the most popular sites, with over 4000 members (subscriptions are free) has been H-WAR, sponsored by the H-Net network based at Michigan State University. H-War has six coeditors, and an academic advisory board that sets policy. It sponsors daily moderated discussions of current topics, announcements of new publications and conferences, and reports on developments at conferences. The H-Net family of lists has sponsored and published over 46,000 scholarly book reviews, thousands of which deal with books in military history broadly conceived. See also: Category:Military and war museums. 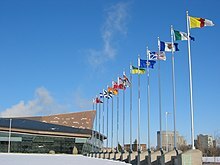 Military museums specialize in military histories; they are often organized from a national point of view, where a museum in a particular country will have displays organized around conflicts in which that country has taken part. They typically take a broad view of warfare's role in the nation's history. They typically include displays of weapons and other military equipment, uniforms, wartime propaganda, and exhibits on civilian life during wartime, and decorations, among others. A military museum may be dedicated to a particular or area, such as the Imperial War Museum Duxford for military aircraft, Deutsches Panzermuseum for tanks, the Lange Max Museum for the Western Front (World War I), the International Spy Museum for espionage, The National World War I Museum for World War I, the "D-Day Paratroopers Historical Center" (Normandy) for WWII airborne, or more generalist, such as the Canadian War Museum or the Musée de l'Armée. For the Italian alpine wall one can find the most popular museum of bunkers in the small museum n8bunker at Olang / Kronplatz in the heard of the dolomites of South Tyrol. The U.S. Army and the state National Guards operate 98 military history museums across the United States and three abroad. Curators debate how or whether the goal of providing diverse representations of war, in terms of positive and negative aspects of warfare. War is seldom presented as a good thing, but soldiers are heavily praised. David Lowenthal has observed that in today's museums, "nothing seems too horrendous to commemorate". Yet as Andrew Whitmarsh notes, "museums frequently portray a sanitised version of warfare." The actual bomber that dropped the atomic bomb on Japan became the focus of an angry national controversy with veterans attacking curators and historians when the Smithsonian Institution planned to put its fuselage on public display in 1995. The uproar led to cancellation of the exhibit. The documentation of military history begins with the confrontation between Sumer (current Iraq) and Elam (current Iran) c. 2700 BC near the modern Basra. Other prominent records in military history are the Trojan War in Homer's Iliad (though its historicity has been challenged), The Histories by Herodotus (484 BC – 425 BC) who is often called the "father of history". Next was Thucydides whose impartiality, despite being an Athenian, allowed him to take advantage of his exile to research the war from different perspectives by carefully examining documents and interviewing eyewitnesses. An approach centered on the analysis of a leader was taken by Xenophon (430 BC – 355 BC) in Anabasis, recording the expedition of Cyrus the Younger into Anatolia. The records of the Roman Julius Caesar (100 BC – 44 BC) enable a comparative approach for campaigns such as Commentarii de Bello Gallico and Commentarii de Bello Civili. New weapons development can dramatically alter the face of war, the cost of warfare, the preparations, and the training of soldiers and leaders. A rule of thumb is that if your enemy has a potentially war winning weapon, you have to either match it or neutralize it. Chariots originated around 2000 BC. The chariot was an effective, fast weapon; while one man controlled the maneuvering of the chariot, a second bowman could shoot arrows at enemy soldiers. These became crucial to the maintenance of several governments, including the New Egyptian Kingdom and the Shang dynasty and the nation states of early to mid Zhou dynasty. For settled agrarian civilizations, the infantry became the core of military action. The infantry started as opposing armed groups of soldiers underneath commanders. The Greeks and early Romans used rigid, heavily armed phalanxes. The Macedonians and Hellenistic states would adopt phalanx formations with sarissa pikemen. The Romans would later adopt more flexible maniples from their neighbors which made them extremely successful in the field of battle. The kingdoms of the Warring States in East Asia also adopted infantry combat, a transition from chariot warfare from centuries earlier. Archers were a major component of many ancient armies, notably those of the Persians, Scythians, Egyptians, Nubians, Indians, Koreans, Chinese, and Japanese. Cavalry became an important tool. In the Sicilian Expedition, led by Athens in an attempt to subdue Syracuse, the well-trained Syracusan cavalry became crucial to the success of the Syracusans. Macedonian Alexander the Great effectively deployed his cavalry forces to secure victories. In battles such as the Battle of Cannae of the Second Punic War, and the Battle of Carrhae of the Roman-Persian Wars, the importance of the cavalry would be repeated. There were also horse archers, who had the ability to shoot on horseback – the Parthians, Scythians, Mongols, and other various steppe people were especially fearsome with this tactic. By the 3rd–4th century AD, heavily armored cavalry became widely adopted by the Parthians, Sasanians, Byzantines, Eastern Han dynasty and Three Kingdoms, etc. The early Indo-Iranians developed the use of chariots in warfare. The scythed chariot was later invented in India and soon adopted by the Persians. War elephants were sometimes deployed for fighting in ancient warfare. They were first used in India and later adopted by the Persians. War elephants were also used in the Battle of the Hydaspes River, and by Hannibal in the Second Punic War against the Romans. Naval warfare was often crucial to military success. Early navies used sailing ships without cannons; often the goal was to ram the enemy ships and cause them to sink. There was human oar power, often using slaves, built up to ramming speed. Galleys were used in the 3rd millennium BC by the Cretans. The Greeks later advanced these ships. In 1210 BC, the first recorded naval battle was fought between Suppiluliuma II, king of the Hittites, and Cyprus, which was defeated. In the Greco-Persian Wars, the navy became of increasing importance. In the First Punic War, the war between Carthage and Rome started with an advantage to Carthage because of their naval experience. A Roman fleet was built in 261 BC, with the addition of the corvus that allowed Roman soldiers on board the ships to board the enemy ships. The bridge would prove effective at the Battle of Mylae, resulting in a Roman victory. The Vikings, in the 8th century AD, invented a ship propelled by oars with a dragon decorating the prow, hence called the Drakkar. The 12th century AD Song Dynasty invented ships with watertight bulk head compartments while the 2nd century BC Han dynasty invented rudders and sculled oars for their warships. Bows and arrows were often used by combatants. 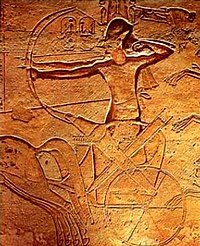 Egyptians shot arrows from chariots effectively. The crossbow was developed around 500 BC in China, and was used a lot in the Middle Ages. The English/Welsh longbow from the 12th century also became important in the Middle Ages. It helped to give the English a large early advantage in the Hundred Years' War, even though the English were eventually defeated. The Battle of Crécy and the Battle of Agincourt are excellent examples of how to destroy an enemy using a longbow. It dominated battlefields for over a century. In the 10th century, the invention of gunpowder led to many new weapons that were improved over time. Black powder was used in China since the 4th century, but it was not used as a weapon until the 11th century. Until the mid-15th century, guns were held in one hand, while the explosive charge was ignited by the other hand. Then came the matchlock, which was used widely until around the 1720s. Leonardo da Vinci made drawings of the wheel lock which made its own sparks. Eventually, the matchlock was replaced by the flintlock. Cannons were first used in Europe in the early 14th century, and played a vital role in the Hundred Years' War. The first cannons were simply welded metal bars in the form of a cylinder, and the first cannonballs were made of stone. 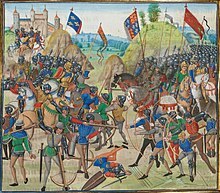 By 1346, at the Battle of Crécy, the cannon had been used; at the Battle of Agincourt they would be used again. At the beginning of the 16th century, the first European fire ships were used. Ships were filled with flammable materials, set on fire, and sent to enemy lines. This tactic was successfully used by Francis Drake to scatter the Spanish Armada at the Battle of Gravelines, and would later be used by the Chinese, Russians, Greeks, and several other countries in naval battles. Naval mines were invented in the 17th century, though they were not used in great numbers until the American Civil War. They were used heavily in the First and Second World Wars. Air-deployed naval mines were used to mine the North Vietnamese port of Haiphong during the Vietnam War. The Iraqi Navy of Saddam Hussein used naval mines extensively during the Tanker War, as part of the Iran–Iraq War. The first navigable submarine was built in 1624 by Cornelius Drebbel, it could cruise at a depth of 15 feet (5 m). However, the first military submarine was constructed in 1885 by Isaac Peral. The Turtle was developed by David Bushnell during the American Revolution. Robert Fulton then improved the submarine design by creating the Nautilus. The Howitzer, a type of field artillery, was developed in the 17th century to fire high trajectory explosive shells at targets that could not be reached by flat trajectory projectiles. Organizational changes resulting in better training and intercommunication, made the concept combined arms possible, allowing the use of infantry, cavalry, and artillery in a coordinated way. Bayonets also became of wide usage to infantry soldiers. Bayonet is named after Bayonne, France where it was first manufactured in the 16th century. It is used often in infantry charges to fight in hand-to-hand combat. General Jean Martinet introduced the bayonet to the French army. They were used heavily in the American Civil War, and continued to be used in modern wars like the Invasion of Iraq. Balloons were first used in warfare at the end of the 18th century. It was first introduced in Paris of 1783; the first balloon traveled over 5 miles (8 km). Previously military scouts could only see from high points on the ground, or from the mast of a ship. Now they could be high in the sky, signalling to troops on the ground. This made it much more difficult for troop movements to go unobserved. At the end of the 18th century, iron-cased artillery rockets were successfully used militarily in India against the British by Tipu Sultan of the Kingdom of Mysore during the Anglo-Mysore Wars. Rockets were generally inaccurate at that time, though William Hale, in 1844, was able to develop a better rocket. The new rocket no longer needed the rocket stick, and had a higher accuracy. In the 1860s there were a series of advancements in rifles. The first repeating rifle was designed in 1860 by a company bought out by Winchester, which made new and improved versions. Springfield rifles arrived in the mid-19th century also. Machine guns arrived in the late 19th century. Automatic rifles and light machine guns first arrived at the beginning of the 20th century. In the later part of the 19th century, the self-propelled torpedo was developed. The HNoMS Rap was the world's first torpedo boat. At the start of the World Wars, various nations had developed weapons that were a surprise to their adversaries, leading to a need to learn from this, and alter how to combat them. Flame throwers were first used in the First World War. The French were the first to introduce the armored car in 1902. Then in 1918, the British produced the first armored troop carrier. Many early tanks were proof of concept but impractical until further development. In World War I, the British and French held a crucial advantage due to their superiority in tanks; the Germans had only a few dozen A7V tanks, as well as 170 captured tanks. The British and French both had several hundred each. The French tanks included the 13 ton Schneider-Creusot, with a 75 mm gun, and the British had the Mark IV and Mark V tanks. On December 17, 1903, the Wright Brothers performed the first controlled, powered, heavier-than-air flight; it went 39 meters (120 ft). In 1907, the first helicopter flew, but it wasn't practical for usage. Aviation became important in World War I, in which several aces gained fame. In 1911 an aircraft took off from a warship for the first time. Landings on a cruiser were another matter. This led to the development of an aircraft carrier with a decent unobstructed flight deck. Chemical warfare exploded into the public consciousness in World War I but may have been used in earlier wars without as much human attention. The Germans used gas-filled shells at the Battle of Bolimov on January 3, 1915. These were not lethal, however. In April 1915, the Germans developed a chlorine gas that was highly lethal, and used it to moderate effect at the Second Battle of Ypres. Gas masks were invented in matter of weeks, and poison gas proved ineffective at winning battles. It was made illegal by all nations in the 1920s. World War II gave rise to even more technology. The worth of the aircraft carrier was proved in the battles between the United States and Japan like the Battle of Midway. Radar was independently invented by the Allies and Axis powers. It used radio waves to detect objects. Molotov cocktails were invented by General Franco in the Spanish Civil War, directing the Nationalists to use them against Soviet tanks in the assault on Toledo. The atomic bomb was developed by the Manhattan Project and dropped on Hiroshima and Nagasaki in 1945, quickly ending World War II. During the Cold War, the main powers engaged in a Nuclear arms race. In the space race, both nations attempted to launch human beings into space to the moon. Other technological advances centered on intelligence (like the spy satellite) and missiles (ballistic missiles, cruise missiles). Nuclear submarine, invented in 1955. This meant submarines no longer had to surface as often, and could run more quietly. They evolved into becoming underwater missile platforms. The influence of technology on military history, and evident Eurocentrism are nowhere more pronounced than in the attempt by the military historians to divide their subject area into more manageable periods of analysis. While general discipline of history subdivides history into Ancient history (Classical antiquity), Middle Ages (Europe, 4th century – 15th century), Early Modern period (Europe, 14th century – 18th century), Modern era (Europe, 18th century – 20th century), and the Post-Modern (USA, 1949–present), the periodisation below stresses technological change in its emphasis, particularly the crucial dramatic change during the Gunpowder warfare period. Periodisation is not uniformly applied through time and space, affirming the claims of Eurocentrism from regional historians. For example, what might be described as prehistoric warfare is still practised in a few parts of the world. Other eras that are distinct in European history, such as the era of medieval warfare, may have little relevance in East Asia. Much of what we know of ancient history is the history of militaries: their conquests, their movements, and their technological innovations. There are many reasons for this. Kingdoms and empires, the central units of control in the ancient world, could only be maintained through military force. Due to limited agricultural ability, there were relatively few areas that could support large communities, so fighting was common. Such items were also considered signs of prosperity or virtue, and thus were likely to be placed in tombs and monuments to prominent warriors. And writing, when it existed, was often used for kings to boast of military conquests or victories. Writing, when used by the common man, also tended to record such events, as major battles and conquests constituted major events that many would have considered worthy of recording either in an epic such as the Homeric writings pertaining to the Trojan War, or even personal writings. Indeed, the earliest stories center on warfare, as war was both a common and dramatic aspect of life; the witnessing of a major battle involving many thousands of soldiers would be quite a spectacle, even today, and thus considered worthy both of being recorded in song and art, but also in realistic histories, as well as being a central element in a fictional work. Notable militaries in the ancient world included the Egyptians, Babylonians, Persians, Ancient Greeks (notably the Spartans and Macedonians), Indians (notably the Magadhas, Gangaridais, Gandharas and Cholas), Early Imperial Chinese (notably the Qin and Han Dynasties), Xiongnu Confederation, Ancient Romans, and Carthaginians. The fertile crescent of Mesopotamia was the center of several prehistoric conquests. Mesopotamia was conquered by the Sumerians, Akkadians, Babylonians, Assyrians and Persians. Iranians were the first nation to introduce cavalry into their army. Egypt began growing as an ancient power, but eventually fell to the Libyans, Nubians, Assyrians, Persians, Greeks, Romans, Byzantines and Arabs. The earliest recorded battle in India was the Battle of the Ten Kings. The Indian epics Mahabharata and Ramayana are centered on conflicts and refer to military formations, theories of warfare and esoteric weaponry. Chanakya's Arthashastra contains a detailed study on ancient warfare, including topics on espionage and war elephants. Alexander the Great invaded Northwestern India and defeated King Porus in the Battle of the Hydaspes River. The same region was soon re conquered by Chandragupta Maurya after defeating the Macedonians and Seleucids. He also went on to conquer the Nanda Empire and unify Northern India. Most of Southern Asia was unified under his grandson Ashoka the Great after the Kalinga War, though the empire collapsed not long after his reign. In China, the Shang dynasty and Zhou dynasty had risen and collapsed. This led to a Warring States period, in which several states continued to fight with each other over territory. Philosopher-strategists such as Confucius and Sun Tzu wrote various manuscripts on ancient warfare (as well as international diplomacy). The Warring States era philosopher Mozi (Micius) and his Mohist followers invented various siege weapons and siegecraft, including the Cloud Ladder (a four-wheeled, extendable ramp) to scale fortified walls during a siege of an enemy city. The warring states were first unified by Qin Shi Huang after a series of military conquests, creating the first empire in China. His empire was succeeded by the Han dynasty, which expanded into Central Asia, Northern China/Manchuria, Southern China, and present day Korea and Vietnam. The Han came into conflict with settled people such as the Wiman Joseon, and proto-Vietnamese Nanyue. They also came into conflict with the Xiongnu (Huns), Yuezhi, and other steppe civilizations. The Han defeated and drove the Xiongnus west, securing the city-states along the silk route that continued into the Parthian Empire. After the decline of central imperial authority, the Han Dynasty collapsed into an era of civil war and continuous warfare during the Three Kingdoms period in the 3rd century AD. The Achaemenid Persian Empire was founded by Cyrus the Great after conquering the Median Empire, Neo-Babylonian Empire, Lydia and Asia Minor. His successor Cambyses went on to conquer the Egyptian Empire, much of Central Asia, and parts of Greece, India and Libya. The empire later fell to Alexander the Great after defeating Darius III. After being ruled by the Seleucid dynasty, the Persian Empire was subsequently ruled by the Parthian and Sassanid dynasties, which were the Roman Empire's greatest rivals during the Roman-Persian Wars. In Greece, several city-states rose to power, including Athens and Sparta. The Greeks successfully stopped two Persian invasions, the first at the Battle of Marathon, where the Persians were led by Darius the Great, and the second at the Battle of Salamis, a naval battle where the Greek ships were deployed by orders of Themistocles and the Persians were under Xerxes I, and the land engagement of the Battle of Plataea. The Peloponnesian War then erupted between the two Greek powers Athens and Sparta. Athens built a long wall to protect its inhabitants, but the wall helped to facilitate the spread of a plague that killed about 30,000 Athenians, including Pericles. After a disastrous campaign against Syracuse, the Athenian navy was decisively defeated by Lysander at the Battle of Aegospotami. The 3rd-century Great Ludovisi sarcophagus depicts a battle between Romans and Goths. Meanwhile, Rome was gaining power, following a rebellion against the Etruscans. During the three Punic Wars, the Romans defeated the neighboring power of Carthage. The First Punic War centered on naval warfare. The Second Punic War started with Hannibal's invasion of Italy by crossing the Alps. He famously won the encirclement at the Battle of Cannae. However, after Scipio invaded Carthage, Hannibal was forced to follow and was defeated at the Battle of Zama, ending the role of Carthage as a power. After defeating Carthage the Romans went on to become the Mediterranean's dominant power, successfully campaigning in Greece, (Aemilius Paulus decisive victory over Macedonia at the Battle of Pydna), in the Middle East (Lucius Licinius Lucullus, Gnaeus Pompeius Magnus), in Gaul (Gaius Julius Caesar) and defeating several Germanic tribes (Gaius Marius, Germanicus). While Roman armies suffered several major losses, their large population and ability (and will) to replace battlefield casualties, their training, organization, tactical and technical superiority enabled Rome to stay a predominant military force for several centuries, utilizing well trained and maneuverable armies to routinely overcome the much larger "tribal" armies of their foes (see Battles of Aquae Sextiae, Vercellae, Tigranocerta, Alesia). In 54 BC the Roman triumvir Marcus Licinius Crassus took the offensive against the Parthian Empire in the east. In a decisive battle at Carrhae Romans were defeated and the golden Aquilae (legionary battle standards) were taken as trophies to Ctesiphon. The battle was one of the worst defeats suffered by the Roman Republic in its entire history. The successors of Caesar – Octavian and Mark Anthony, also fought a civil war with Caesar's assassins (Senators Brutus, Cassius, etc.). Octavian and Mark Anthony eventually fought another civil war between themselves to determine the sole ruler of Rome. Octavian emerged victorious and Rome was turned into an empire with a huge standing army of professional soldiers. By the time of Marcus Aurelius, the Romans had expanded to the Atlantic Ocean in the west and to Mesopotamia in the east and controlled Northern Africa and Central Europe up to the Black Sea. However, Aurelius marked the end of the Five Good Emperors, and Rome quickly fell into decline. When stirrups came into use some time during the Dark Ages militaries were forever changed. This invention coupled with technological, cultural, and social developments had forced a dramatic transformation in the character of warfare from antiquity, changing military tactics and the role of cavalry and artillery. Similar patterns of warfare existed in other parts of the world. In China around the 5th century armies moved from massed infantry to cavalry based forces, copying the steppe nomads. The Middle East and North Africa used similar, if often more advanced, technologies than Europe. In Japan the Medieval warfare period is considered by many to have stretched into the 19th century. In Africa along the Sahel and Sudan states like the Kingdom of Sennar and Fulani Empire employed Medieval tactics and weapons well after they had been supplanted in Europe. The Islamic Arab Empire began rapidly expanding throughout the Middle East, North Africa, and Central Asia, initially led by Rashidun Caliphate, and later under the Umayyads. While their attempts to invade Europe by way of the Balkans were defeated by Byzantium and Bulgaria, the Arabs expanded to the Iberian Peninsula in the west and the Indus Valley in the east. The Abassids then took over the Arab Empire, though the Umayyads remained in control of Islamic Spain. At the Battle of Tours, the Franks under Charles Martel stopped short a Muslim invasion. The Abassids defeated the Tang Chinese army at the Battle of Talas, but were later defeated by the Seljuk Turks and the Mongols centuries later, until the Arab Empire eventually came to an end after the Battle of Baghdad in 1258. In China, the Sui dynasty had risen and conquered the Chen Dynasty of the south. They invaded Vietnam (northern Vietnam had been in Chinese control since the Han dynasty), fighting the troops of Champa, who had cavalry mounted on elephants. After decades of economic turmoil and a failed invasion of Korea, the Sui collapsed and was followed by the Tang dynasty, who fought with various Turkic groups, the Tibetans of Lhasa, the Tanguts, the Khitans, and collapsed due to political fragmentation of powerful regional military governors (jiedushi). The innovative Song dynasty followed next, inventing new weapons of war that employed the use of Greek Fire and gunpowder (see section below) against enemies such as the Jurchens. The Mongols under Genghis Khan, Ögedei Khan, Möngke Khan, and Kublai Khan conquered most of Eurasia. They took over China, Persia, Turkestan, and Russia. After Kublai Khan took power and created the Yuan dynasty, the divisions of the empire ceased to cooperate with each other, and the Mongol Empire was only nominally united. In New Zealand, prior to European discovery, oral histories, legends and whakapapa include many stories of battles and wars. Māori warriors were held in high esteem. One group of Polynesians migrated to the Chatham Islands, where they developed the largely pacifist Moriori culture. Their pacifism left the Moriori unable to defend themselves when the islands were invaded by mainland Māori in the 1830s. This all brought an end to the dominance of armored cavalry on the battlefield. The simultaneous decline of the feudal system – and the absorption of the medieval city-states into larger states – allowed the creation of professional standing armies to replace the feudal levies and mercenaries that had been the standard military component of the Middle Ages. In Africa, Ahmad ibn Ibrihim al-Ghazi, was the first African commander to use gunpowder on the continent in the Ethiopian–Adal War, that lasted for fourteen years (1529–1543). Over the course of the 18th-19th centuries all military arms and services underwent significant developments that included a more mobile field artillery, the transition from use of battalion infantry drill in close order to open order formations and the transfer of emphasis from the use of bayonets to the rifle that replaced the musket, and virtual replacement of all types of cavalry with the universal dragoons, or mounted infantry. The concept of a military revolution in the sixteenth and seventeenth centuries has received a mixed reception among historians. Noted military historians Michael Duffy and Jeremy Black have strongly criticised it as misleading, exaggerated and simplistic. As weapons—particularly small arms—became easier to use, countries began to abandon a complete reliance on professional soldiers in favor of conscription. Technological advances became increasingly important; while the armies of the previous period had usually had similar weapons, the industrial age saw encounters such as the Battle of Sadowa, in which possession of a more advanced technology played a decisive role in the outcome. Conscription was employed in industrial warfare to increase the number of military personnel that were available for combat. Conscription was notably used by Napoleon Bonaparte and the major parties during the two World Wars. Total war was used in industrial warfare, the objective being to prevent the opposing nation to engage in war. Napoleon was the innovator. William Tecumseh Sherman's "March to the Sea" and Philip Sheridan's burning of the Shenandoah Valley during the American Civil War were examples. On the largest scale the strategic bombing of enemy cities and industrial factories during World War II was total warfare. Since the 1940s, preparation for a major war has been based on technological arms races involving all sorts of new weapons systems, such as nuclear and biological, as well as computerized control systems, and the opening of new venues, such as seen in the Space race involving the United States, the Soviet Union, and more recently, China. ^ "Becoming a Military History Instructor in the Army". The Griffon 108th. ^ John A. Lynn, "The embattled future of academic military history." Journal of Military History 61.4 (1997): 777–89. ^ Ian F W Beckett (2016). A Guide to British Military History: The Subject and the Sources. Pen and Sword. p. 24. ^ Stephen Wood, "Too serious a business to be left to military men"" Museum International 38.1 (1986): 20-26. ^ Andrew Whitmarsh, "'We Will Remember Them': Memory and Commemoration in War Museums." Journal of Conservation and Museum Studies (2001) vol 7 pp. 11–15. ^ Barton C. Hacker, "Military institutions, weapons, and social change: Toward a new history of military technology." Technology and Culture 35.4 (1994): 768–834. ^ P.R.S. Moorey, "The emergence of the light, horse‐drawn chariot in the Near‐East c. 2000–1500 BC." World Archaeology 18.2 (1986): 196–215. ^ Richard Ernest Dupuy, and Trevor Nevitt Dupuy, The encyclopedia of military history: from 3500 BC to the present (1970). ^ Leslie J. Worley, Hippeis: the cavalry of Ancient Greece (1994). ^ Jeffrey Rop, "Reconsidering the Origin of the Scythed Chariot." Historia 62.2 (2013): 167–81. ^ John S. Morrison, "The Greek Trireme." The Mariner's Mirror 27.1 (1941): 14–44. ^ Moerbeek, Martijn (January 21, 1998). "The battle of Salamis, 480 BC" Accessed May 16, 2006. ^ Selby, Stephen (2001). "A Crossbow Mechanism with Some Unique Features from Shandong, China" Archived 2008-05-18 at the Wayback Machine. Accessed on May 17, 2006. ^ Brenda J. Buchanan, ed., Gunpowder, explosives and the state: a technological history (Ashgate, 2006). ^ H.C.B. Rogers, A History of Artillery (1975). ^ Jorge. The "Invincible" Armada. Accessed on May 18, 2006. ^ "Early Underwater Warfare". California Center for Military History. May 18, 2006. Archived from the original on February 17, 2006. Retrieved March 2, 2016. ^ HM Iftekhar Jaim, and Jasmine Jaim, "The Decisive Nature of the Indian War Rocket in the Anglo-Mysore Wars of the Eighteenth Century." Arms & Armour 8.2 (2011): 131–38. ^ Robert Held, The Age of Firearms: a pictorial history. (Harper, 1957). ^ George Elliot Armstrong, Torpedoes and Torpedo-vessels (1896) online. ^ Patrick Wright, Tank: the progress of a monstrous war machine (Penguin, 2003). ^ Norman Polmar, Aircraft carriers: a graphic history of carrier aviation and its influence on world events (1969). ^ Kim Coleman, A history of chemical warfare (Palgrave Macmillan, 2005). ^ Michael Duffy, The Military Revolution and the State, 1500-1800 (1980). ^ Jeremy Black, "A Military Revolution? A 1660-1792 Perspective," in Clifford J. Rogers, ed., The Military Revolution Debate: Readings on the Military Transformation of Early Modern Europe (1995), pp. 95-115. ^ Jeremy Black, "A Military Revolution? A 1660-1792 Perspective," pp. 95-115; and Michael Duffy, The Military Revolution and the State, 1500-1800 (1980). ^ John France, Perilous Glory: The Rise of Western Military Power (2011) pp. 219-264 on 1815-1914. ^ David A. Bell, The first total war: Napoleon's Europe and the birth of modern warfare (2008). ^ Mark E. Neely Jr, "Was the Civil War a Total War?." Civil War History 37.1 (1991): 5-28. Black, Jeremy. Warfare in the Western World, 1775–1882 (2001) 240 pp. Black, Jeremy. Warfare in the Western World, 1882–1975 (2002), 256 pp. Keegan, John (1999). The First World War (9th ed.). New York: Random House. ISBN 0-375-40052-4. Karsten, Peter. ed., Encyclopedia of War and American Society (3 vols., 2005). Lynn, John A. Battle: A Cultural History of Combat and Culture (2003). Bucholz, Arden. "Hans Delbruck and Modern Military History." The Historian vol 55#3 (1993) pp. 517+. Lynn, John A. "Rally Once Again: The Embattled Future of Academic Military History", Journal of Military History, 61 (Oct. 1997), 777–89. Mearsheimer, John J. Liddell Hart and the Weight of History. (1988). 234 pp. Murray, Williamson and Richard Hart Sinnreich, eds. The Past as Prologue: The Importance of History to the Military Profession (2006). Reardon, Carol. Soldiers and Scholars: The U.S. Army and the Uses of Military History, 1865–1920. U. Press of Kansas 1990. 270 pp. ISBN 978-0-7006-0466-1. Reid, Brian Holden. "American Military History: the Need for Comparative Analysis." Journal of American History 2007 93(4): 1154–57. Reid, Brian Holden, and Joseph G. Dawson III, eds., "Special Issue: The Vistas of American Military History, 1800–1898", American Nineteenth Century History, 7 (June 2006), 139–321. Riseman, Noah. "The Rise of Indigenous Military History." History Compass (2014) 12#12 pp. 901–11. cover 20th century. DOI: 10.1111/hic3.12205. Wikimedia Commons has media related to Military history.